The recent balmy weather during Artscape springs to my memory like a sweet dream while the Mid-Atlantic heat wave only begins to subside. 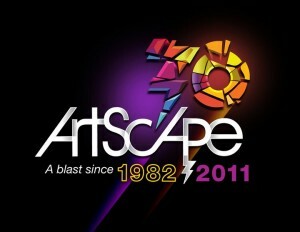 Artscape is held in Baltimore every summer and is the nation’s largest free arts festival. It includes: great opera, theater, dance and street theater performances, classical and experimental music, in addition to an assortment of music from local and national recording artists, artwork from artisans from across the nation, art cars, children’s activities, cultural exhibitions both on and off-site, film, Janet & Walter Sondheim Artscape Prize, videogames, and food and beverages, located throughout the entire Mt. Royal corridor. I had the pleasure of joining a talented group of musicians, Vivre Musicale, to perform at Artscape 2011. I took that opportunity to find out more about Vivre Musicale and why the executive team find performances like Artscape to be an important part of their mission. Why is it important for Vivre Musicale to perform at Artscape? Rash: I believe it is important for Vivre Musicale (VM) to perform at Artscape because of the nature of Artscape: a free, all-inclusive environment that allows the community to partake of a moveable feast of artistic output. It provides artists and groups like VM an opportunity to meet these audiences, build support, spread the word, and encourage greater, more dynamic participation in the arts through accessible means. Toro: With Artscape having such a diverse audience it would only behoove Vivre Musicale to reach out to everyone in the Baltimore area. We felt there’s no better time for VM to be exposed, recognized, appreciated, & respected. Abel: Vivre Musicale is young – we’re just beginning our third season, and we are really trying to get out into the community more and show people we’re here and we want to share music with them. Rash: Artscape is unique in its spirit of inclusiveness which is something we at VM work to foster. Many first time classical music goers have expressed concern about not “getting it,” not understanding or having the background knowledge to access this demographic of art. Abel: Also, a core component of Vivre Musicale’s mission is collaborative art, and interaction with the artistic community outside of music. Crafters, painters, photographers, dancers, actors, writers, etc…. we’re all artists working toward the common goal of expression and enrichment, so Vivre Musicale is always looking for new ways to share experiences with other artists. Artscape is a great venue for that sort of cross-pollination. What are some of the specific challenges in programming for Artscape? Abel: I think that the great thing about Artscape is that there’s really something for everyone. But that means that the audience for whom you’re trying to program music is extremely varied in age, race, religion, socio-economic background, and general taste. Rash: We weren’t sure what the venues would be like, not having performed at Artscape before. So choosing repertoire that carried well in the space was a minor concern. From there, creating a program that spoke to the theme of our season, “The Passion for the Arts,” while remaining engaging and artful required a great deal of consideration. Jorge and I thoroughly enjoy creating fascinating concert programs and Artscape’s uniqueness made our job in doing so that much more rewarding. I know for me I was primarily concerned with the mood that would be set by our programming asking questions regarding transitions between works, the continuation of an ethos or the deconstruction of such, etc. Toro: We want to make sure that we appeal to everyone. No one wants to come to a boring concert. We like to incorporate some well-known pieces with some pieces that aren’t done too often (or ever) but are just as interesting! Rash: For this concert Jorge was primarily responsible for programming and we would bounce ideas off of each other. Initially we submitted 3 concert proposals, Voce, Viento, and Mixto. Voce being all vocal repertoire, Viento being wind and string repertoire, and Mixto being a collaboration of the previous two which is more representative of our concerts. Artscape chose the Voce concert and we began pulling from our roster of artists to create a tonal palette that brought balance and harmony to the concert. Abel: We know that we can’t possibly please everyone, but we want to try to offer a program that reaches a broad audience. Drawing new audiences to classical music is a challenge for all music groups, from the local choir to the Met, and it is no different for us. Your specific programming has been a calling card of Vivre Musicale. How do you approach programming for each season? Rash: It’s interesting really in that we start with a theme which generally the artistic team has discussed months, if not years, earlier. One thing you have to know is that the admin team is a team of long-associated friends. We have worked with each other for years in some capacity or another. We inspire each other and have the utmost respect for the talents that each of us possess. To that end our season programming is truly collaborative. The first season, “Evolving Landscapes,” was primarily planned by Jorge and me. We are constantly attending recitals and concerts whenever we can, taking notes on the works, the pathos of the works, and mentally building potential programs around a concept, thought, mood, or even timbre with which we’ve fallen in love. From there we refer to our season theme which helps us streamline the forthcoming concerts. In the 2nd season, “Marriage of Mediums,” Jessica came up with the theme and together with one of our board members suggested a curatorial model of program planning. Abel: We’ve tried to focus our seasons and musical selections around themes, imagery, and experiences that everyone is familiar with. The hope is to draw them in with something they know, and keep them interested by giving it to them in a way they haven’t experienced before. It’s exciting for us to explore these themes in a new way, so we hope the audience enjoys the presentation. Rash: We’re always refining our programs through collaboration, making suggestions, and pulling out repertoire. We also have a list of artists with whom we’ve worked and look forward to working with again. This contingency indirectly helps us plan for each season. Toro: Usually the curators have a certain instrumentation in mind. At times they have a group in mind that can collaborate with Vivre Musicale. We are all about collaboration with small ensembles! Rash: Vivre Musicale is currently planning our 3rd season, “The Passion for the Arts,” which also uses the curatorial model. Because we’re looking to create an atmosphere of intimacy we’re paring back our roster and looking towards a greater level of artistic, chamber music refinement. Vivre Musicale provides each curator with the theme for the season and with a list of hopes, desires, wishes, and needs. They are then asked to create a program that speaks to some element of the stated theme. This season we believe our curators have done a good job in doing just that. Why is it important for VM to feature a visual artist along with performing artists? Toro: When Berginald Rash (the Co-Founder & Artistic Director) and I were talking about forming Vivre Musicale, we definitely wanted a chamber organization different from others. Not only did we want to endorse the performing arts but the visual as well. We want to be a very well-rounded arts organization. In past seasons, we have incorporated a lot of art work and photography from various young artists. Their work is available on our website. This upcoming season we are excited to collaborate with dance. Rash: In the past we’ve coupled visual art with performance art, that however is not the standard. The idea is to bring together different art forms with our brand performance art. That can include visual art but it is not limited to that. We enjoy collaborations with all of the art forms such as dance, drama, spoken word, culinary arts, even graffiti art, we just haven’t gotten to all of them yet, but trust me, they’re coming! It is our desire to give our audiences that childlike wonder again and ask questions, open up dialogue, feel involved and inquisitive about what is going on. We feel that it is our job to create living art that allows for interpretation and reinterpretation. I think that is best seen in the “Blue” concert from last season wherein we paired quite literal jazz/blues idioms (Ellington and Davis) with more intrinsically classical idioms (Satie and Paladhile), to the truly classical idioms (Brahms and Messiaen). From there, visual artist Lilly Holtzman took the concept of Blue, the works provided, and unified them through a visual arts emulsification process. Abel: As musicians, we belong to a musical network that is full of talent and creativity, but there are other artistic circles out there in our community, and we want to get involved in that too. If you look back to some of the great artists in history, they were friends with each other – across artistic genres – they inspired and respected each other, and helped each other to grow and to feel good about what they were pursuing. We want to foster those kinds of relationships. Toro: I love traveling… but the perk is the excitement the happens at the end of every concert. It is very rewarding for me to hear from audience members how much they enjoyed our concerts. How we are a very unique organization with a lot of passion and drive. I also find equally rewarding hearing all the positive feedback from our artists; they all want to keep working with Vivre Musicale. Rash: My love of music, my commitment to our audiences, and to the artists whom we serve keep me motivated. Abel: I always say, you don’t really choose music – it chooses you. And I feel that way in this case. I think we’re all driven to keep doing it, for ourselves, for the musicians who perform with us, and for the community. We can’t help it. Of course, often times it’s trying – stressful, anxiety-inducing, and totally exhausting, but it is also thrilling and very satisfying when you get to see and hear and live the end result. It is truly amazing for me to interact with groups like Vivre Musicale. They have their fingers so firmly on the pulse of innovation in today’s classical music scene. Vivre Musicale knows their audience. They program in a special way that invites people to come back for something more. I wholeheartedly endorse their use of curatorial programming and would love to see more small arts organizations adopting this concept. In fact, many do. Which only confirms my faith that classical music is alive and well. If you would like to see some of the performances from Vivre Musicale’s concert at Artscape, you can visit their YouTube page. I also strongly suggest that you check out their website to read more about their programs, past and future.